I was surprised last week when I came home to find our flatbed and a trailer full of Dungeness crab pots parked outside the house. 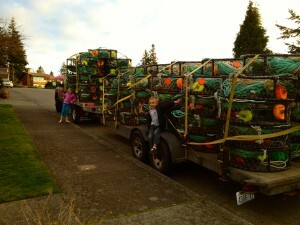 The arrival of G’s flatbed and trailer and a few of his 500 pots means that our 2013 crab season has come to an end. Our family hasn’t spent much time together since August. I’m glad that G is home. It’s nice to have him around, even if tax preparation, longline quota, and boat work still occupies his time for now. Things remain a little goofy in my world, but I am committed to taking it all one step at a time. It would be easier if I could just convince everyone to do what I think is best or even rewind the clock a few months, but that is not going to happen. It will all get better. The sun is shining more frequently and the rain has eased. We made it to April and to spring. On a lighter note, Happy Birthday today to my dad, a fourth-generation commercial fishing captain, and to my mom, an amazing fishing wife and mother. Each of them has taught me all I need know about what it takes to survive in this lifestyle. I love you, Mom and Dad. I couldn’t do what I do now without each of your lifelong examples of strength and grace.